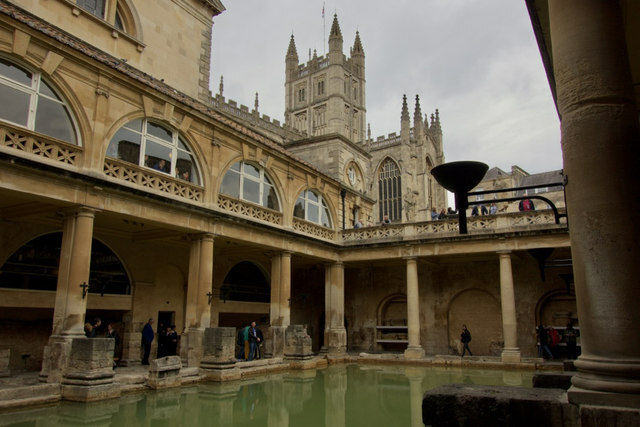 Popular historic site and visitor attraction in the city centre Link The tower of the adjacent Bath Abbey is in the background. The weird inscription on Kingston Buildings ST7564 : Kiŋston Bildiŋz, near Bath Abbey looks as if it was done by a proponent of the phonetic spelling campaign. This proposed the removal of all superfluous letters, such as the 'u' in 'buildings', and the introduction of the 'ŋ' symbol for the 'ng' sound which occurs in Germanic languages but not, to the best of my knowledge, in Romance or Slav languages.